I recently found a great site for job searching. http://www.rapidjob.info allows users to search for the local industrial zone, find the companies that work there and then apply directly on the website of the individual company. For example, if you are looking for work in Netanya, you’d click on שרון and then נתניה to see a list of al the companies that are located in the Netanya area. 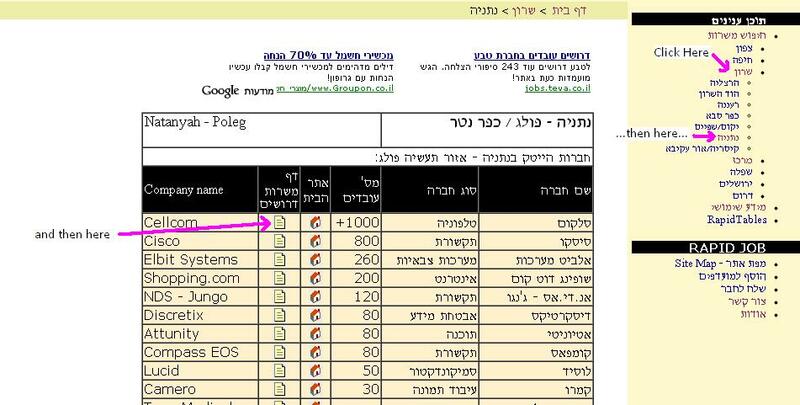 Afterwards, you’d look for the places with a דף משרות דרושים, click on the little page icon for the web site of the company and apply for the job. I am not sure how often the list of companies is updated, but the content I saw looks current. Note: The companies listed are high-tech and bio tech companies, but such companies also have all sorts of non-scientific departments (finance, marketing etc) so its still work a look. By jonnydegani in Finding a Job in Israel on July 5, 2012 .